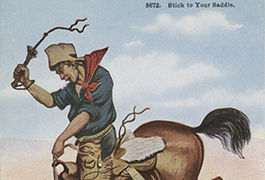 In general, collecting at the DeGolyer Library emphasizes the American West, the borderlands, exploration, business history and transportation, particularly the railroads. The DeGolyer houses extensive photographic collections totaling over 900,000 images. 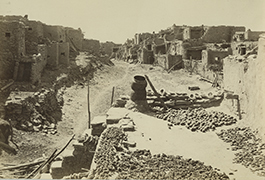 Included are photographs by such important Western landscape photographers as Carleton Watkins, Andrew Russell, Alexander Gardner, William Henry Jackson, John Hillers, Charles Roscoe Savage, F. Jay Haynes, Edward Curtis, Robert Benecke and Laura Gilpin. The DeGolyer has several rare Western accessions, including Alexander Gardner’s 1867 portfolio, Across the Continent on the Kansas Pacific Railroad (Route of the 35th Parallel), which is one of only four known copies of this early, significant western landscape project. 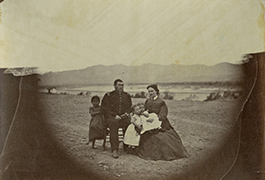 In the DeGolyer collections, there are also examples of early photographic processes and formats covering the history of photography such as daguerreotypes, ambrotypes, tintypes, stereographs, cartes de visite, photographically illustrated books, real photographic postcards, and albumen and gelatin silver prints from ca. 1846 to 1960s. Journey through the Yellowstone National Park and Northwestern Wyoming, 1883. 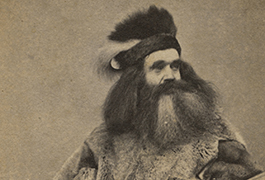 Our Denver Story, 1863, including albums, photographs, correspondence, drawings, and ephemera documenting Jane Whiteley's trip to Denver by stage coach in 1863. Pacific Coast Scenery, 1872, by Houseworth and Co. Professor Sedgwick's illuminated lectures "across the continent"
San Francisco album: photographs of the most beautiful views and public buildings of San Francisco, 1856, by G.R. Fardon. The Great Union Pacific Railroad, Excursion to the Hundredth Meridian: From New York to Platte City, 1867, published by The Republican Company. 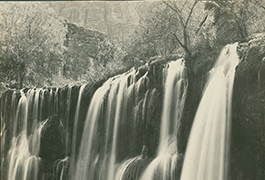 139 items from the Tourist album: Mexico, Arizona, California, Colorado and Utah, which contains 287 photographs; 152 items are in the Mexico: Photographs, Manuscripts, and Imprints collection. Union Pacific Railroad Illustrations, 1869, and Union Pacific Railroad. Photographical Illustrations. (also known as The Great West illustrated in a series of photographic views across the Continent taken along the line of the Union Pacific Railroad ...), 1869, by Andrew Russell. Items in SMU Libraries Digital collections are digitized following the nCDS Digitization Guidelines and Procedures. 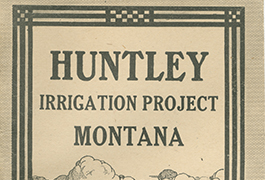 Digital collections are created under the guidelines of the Norwick Center's Filenaming, Workflow, and Metadata Guidelines, or through specialized metadata profiles tailored for the collection. Copyright usage terms vary throughout the collection. Each item contains information about usage terms. If SMU does not have the right to publish the item on the Internet, only the item's metadata will be available and the digitized object will be available on a restricted access basis. Such items may only be viewed on campus. When items are available for use, please cite DeGolyer Library, Southern Methodist University. A high-quality version of these files may be obtained for a fee by contacting degolyer@smu.edu.